Over the course of the week, the Free Jazz Blog is taking stock of some recent recordings featuring the guitar. We begin today with a focus on solo guitar; Tuesday, the delicious fire of the power trio; Wednesday some other configurations; Thursday it is experimental and noise; and Friday, a couple of guitarists who are pushing the boundaries of the instrument's role in free music. What is it about a solo guitar that is so alluring? So rife with possibilities? So able to convey ... a lot of information, a lot of emotion, a lot of music with just six strings (Or 42 if you've got one of these things). Is it the direct contact with the string? The flesh of fingers plucking, struming, stroking the strings and plumbing the depths? The natural reverb of an acoustic? The electronic wizardry of the electric? For me, I can just a strike a string or two, listen to it vibrate and it sounds like a song. The solo guitar is its own puzzle. Whether you approach it like Julian Bream from a classical angle, Leo Kottke from a folk angle, Joe Pass simulating a jazz ensemble or Larry Coryell unravelling Ravel, the delicate balance of what is played and what is implied is fascinating. 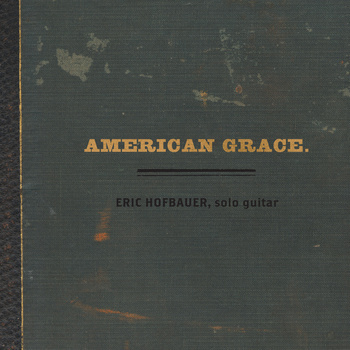 Guitarist Eric Hofbauer has created a masterful showcase with American Grace, a mix of folk, jazz, blues and rock styles. Or, perhaps best described as a deep exploration of American music. Unadorned and uninhibited, the acoustic guitar is recorded clearly, every hit or miss preserved in sonic crystal. Over the course of 19 tracks, he covers the early blues like 'West End Blues', rhythmic tone poems like 'Beat the Drum' and even lends a quasi-classical feel to a pop pieces 'True Colors'. The thoughtfulness he puts into songs, like the aforementioned arrangement of the Cindy Lauper piece is present throughout. Listen to the intervallic leaps on 'Mileage', it's pretty fascinating. Overall, a great listen, and for me, a new guitarist to check out. To be released on March 13th. If you're looking for a great starting place for understanding what a guitar is, then I've got just the album for you. Actually two. Clean Feed's 'I Never Meta Guitar' and now 'I Never Meta Guitar Too' is an aptly titled clever play on words. ... like Ava Mendoza whose fuzzed out shards of sound pile up over a solid little bass line loop on 'Mandible Moonwalk'. Or Ben Tyree who sonorous acoustic guitar moves sumptuously in an accessibly beautiful arc on 'The Gatekeeper'. And then there is Yasuhiro Usui gives us a head scratcher on 'Headland', moving between forays into noise, chaotic fretting, spacey textures and melodic snippets. Each piece is different, exploring and pushing the boundaries of the instrument. Joel Harrison creates a whole world of sound and acoustic textures on 'Loon,' while Zach Layton lays down an evocative and slowly expanding soundscape with his electric guitar and looping tools on 'Thus Gone,' creating a sonic temple of reverb. 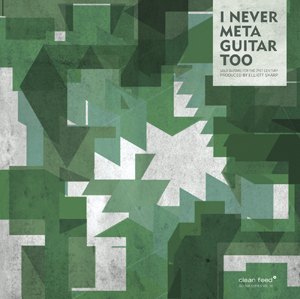 I Never Meta Guitar Too is a continuation of curator Elliot Sharp's work to bring both known and emerging artists work together. The pieces are all created by the artists and reflect a huge swath of what is possible with a single guitar (though not necessarily a single voice). Great, I've been enjoying these theme weeks. I don't have much solo guitar in my collection. What are people's favorites? Check out Marc Ducret's Tower Vol 4 ( joe reviewed it here a little while back) and Marc Ribot's Silent Movies (also reviewed here). I also just stumbled upon a duo that may be interesting, Nels Cline & Elliot Sharp's Open the Door, not a solo effort but quite worth checking out. next to the wonderful "The Matriarch and the Wrong Kind of Flowers" I would also recommend Stian Westerhus' "Pitch Black Star Spangled". Also, check out "Black Sea" by Christian Fennesz. I am really looking forward to this week, too. Great idea, Paul.